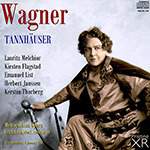 Without doubt one of the great recorded performances of Wagner's opera Tannhäuser, this 1941 radio broadcast, live from New York's Metropolitan Opera House, follows our recent release of the Met's 1940 production of Die Walküre (PACO125) and was drawn from very similar source material, allowing us to offer a previously undreamed of sound quality in these recordings. An A-B comparison of this with the Sony set is shocking. The difference is not subtle. The Sony set sounds like a 1940 AM broadcast. This sounds like a professional studio commercial recording from 1940, and a good one at that. Pristine’s XR stereo remastering gives a sense of the space of the Met, and the result is thrilling in a way one never thought this performance would be." If some of the sides in the present recording of Tannhäuser were not quite as clean as one might hope for, and the microphone placement is a little further back from the principal singers by comparison to Die Walküre, this is perhaps minor criticism in the context of what these generally well-preserved discs have to offer. Once again, XR remaatering, coupled with Ambient Stereo processing, serves up an aural and musical treat which surely renders this an absolute must-have for Wagnerians. As the New York Times stated on the day following this performance: "Every singer of the strong cast happened to be in exceptionally fine vocal form, and the orchestra, under Erich Leinsdorf, provided a support worthy of the expert achievements of those on stage" - what more could one possibly ask for? It is many years since Wagner’s “Tannhaeuser’’ enjoyed a performance comparable in excellence to that accorded the work at its initial presentation of the season, yesterday afternoon, at the Metropolitan Opera House. One or another of the roles has been sung as capably on occasion, but at no other time in the recent annals of the institution have all of the participants reached so high a level of accomplishment in this opera, or has the spirit of the masterpiece been so completely grasped. Every singer of the strong cast happened to be in exceptionally fine vocal form, and the orchestra, under Erich Leinsdorf, provided a support worthy of the expert achievements of those on stage. For a number of seasons “Tannhaeuser” has been the weakest of the Metropolitan’s Wagnerian productions. It has limped and dragged and been bereft of life or cohesion. Yesterday all this was changed. The performance moved smoothly and impressively from the start. It was filled with significant drama, and possessed real mood and atmosphere. As a rule the first act has been particularly unsatisfactory as a whole. But yesterday it received a treatment unmatched hereabouts for a long while. One reason for the improvement was the splendid condition of Lauritz Melchior’s voice in his negotiation of the name part. Mr. Melchior customarily struggles manfully, but rather futilely, with the difficult music allotted him in this division of the opera. On this occasion, however, he had his tones under superior control, and succeeded in making even the trying measures of “Dir toene Lob’’ well forth in free and well-rounded sounds. Under these auspicious conditions the great duet of the opening scene, with Kerstin Thorborg as the Venus and Mr. Melchior in his best estate, boasted a really memorable interpretation. Most operatic impersonators of Venus are not able to supply the pulchritude expected of the delineator of this fairest goddess of the pantheon. Miss Thorborg made a plausible appeal to the eye and her acting was natural, graceful and appealing. She was in superb voice, delivering every phrase with splendid tone as well as convincing power and eloquence. She was equally effective in the more seductive moments of the score and in those depicting rage, vindictiveness or despair. Since last heard here in this opera, Kirsten Flagstad has brought a deeper insight to her interpretation of Elisabeth. She has sung it as superbly from the vocal angle heretofore, but never with such searching human feeling. The gain in expressiveness was nowhere more telling than in the finale. Of the second act, where from the poignant cry, “Zurueck von ihm,” onwards, the emotional content of the music was revealed with new and profoundly touching fervor, tenderness and simplicity. Herbert Janssen made a sympathetic, rich-voiced Wolfram, and did some of the best singing yet heard from him during the afternoon. The Landgraf of Emanuel List was a dignified portrayal, and during his contributions to the noteworthy performance Mr. List’s tones were more firm and steady than usual. Maxine Stellman sang adequately as the young shepherd, but Mack Harrell’s voice was too light for Biterolf’s music. The chorus did its share in making the occasion a success, and the ballet, though not always with the orchestra, danced the bacchanale with considerable élan. Never before had Mr. Leinsdorf made the orchestra sound as rich and sensitive in this work, and his tempi were far better chosen than previously. He still favored a very brisk pace for the march of the second act. Otherwise he was more prone to follow tradition than heretofore, and the orchestra played under his leadership with the same enthusiasm that marked the endeavors of all concerned in this outstanding performance, which was heard by a demonstrative capacity audience. In Fanfare 39:2, both Colin Clarke and I reviewed (with similar enthusiasm) Immortal Performances’s release of the 1942 Met Tannhäuser broadcast with a similar cast, but George Szell leading and Flagstad and Kipnis replacing Thorborg and List. In my review I also published a chart of the various Melchior Tannhäuser performances in circulation, as I believed then and continue to believe now that every serious opera lover and collector should have at least one example of his remarkable portrayal. That chart is repeated here. No tenor since the beginning of recordings through the present has absorbed the vocal and dramatic demands of this role so completely into his vocal cords and his spirit as Melchior. The combination of beauty and richness of timbre, dramatic involvement, vocal imagination and raw power makes Melchior’s Tannhäuser one of the classic assumptions of any role by any singer in the 20th century. Any of the six performances listed above will be a revelation to you if you have not encountered it, but if you are looking for a single overall recommendation, the case becomes trickier. In that earlier review, available in the Fanfare Archive, I narrowed the choice down to two—the Immortal Performances transfer of the 1942 Szell or this 1941 Leinsdorf. This one offers the superior Elisabeth of Flagstad, whose glorious voice soars through the music with a gleam and majesty that surpasses Traubel, despite Traubel’s many assets. It is a case of the very good set opposite the uniquely great. On the other hand, 1942 wins the competition in the role of Landgraf, again the quite good List giving way to the magnificence of Alexander Kipnis. What settles it for me, though, is the conducting of George Szell vs. that of Leinsdorf. Neither conductor brings what you would call expansive warmth to their readings, but Szell’s greater attention to details of balance, to precision of attacks, to internal rhythmic pulse, and surprisingly greater flexibility of phrasing, make his the performance I am likely to return to more frequently. Leinsdorf is not bad, not by a long shot. But there are moments (starting even in the Prelude) that seem a bit square when compared to the consistent momentum of Szell. With this 1941 Tannhäuser available now in better sound than earlier releases, the choice between this and 1942 is a bit more difficult. Even if I didn’t receive copies for review purposes, I would have purchased both, because each is irreplaceable in its way. Hearing the combination of Melchior, Flagstad, and Thorborg is not an opportunity to be taken lightly. Neither is hearing what the more imaginative Szell does with the score, and in the end that would tip me in the direction of 1942. That we have both of these performances available to us, restored to a level of reproduction that requires no real adjustment on the listener’s part, feels like some kind of operatic miracle. This article originally appeared in Issue 39:6 (July/Aug 2016) of Fanfare Magazine.